Author of the "Sefer Yosippon," a history of the Jews from the time of the destruction of Babylon (539 B.C.) to the downfall of the Jewish state (70 C.E. ), with historical accounts of Babylonia, Greece, Rome, and other countries. In the current text the author professes to be the old Greek historian Flavius Josephus, giving to the name "Joseph" the Greek ending "on" ("Josephon," "Joseppon," or "Josippon" [ ]. His Arabic name "Yusibus" is, according to Wellhausen, identical with "Egesippus"). A gloss gives the form from the Italian, "Giuseppe." Down to the eighteenth century, his work was universally known as the "Hebrew," or the "smaller, Josephus" as contrasted with the work now commonly known under the name of Josephus and written in Greek. It is generally held that the work was composed by a Jew living in southern Italy. Scaliger and Zunz believed that he lived in the middle of the ninth century; but Zunz later modified his view, placing the date at 940. The Mohammedan writer Ibn Ḥazm (d. 1063) was acquainted with the Arabic translation of the "Yosippon" made by a Yemen Jew, and Chwolson believes therefore that the author of the "Yosippon" lived at the beginning of the ninth century. No Jewish author mentions this chronicle before Dunash ibn Tamim (10th cent. ), and even the passage in Dunash supposed to refer to the "Yosippon" does not certainly do so. Trieber holds the singular view that the author lived in the fourth century. It was perhaps due to Jerahmeel ben Solomon that the work received its traditional title "Yosippon." 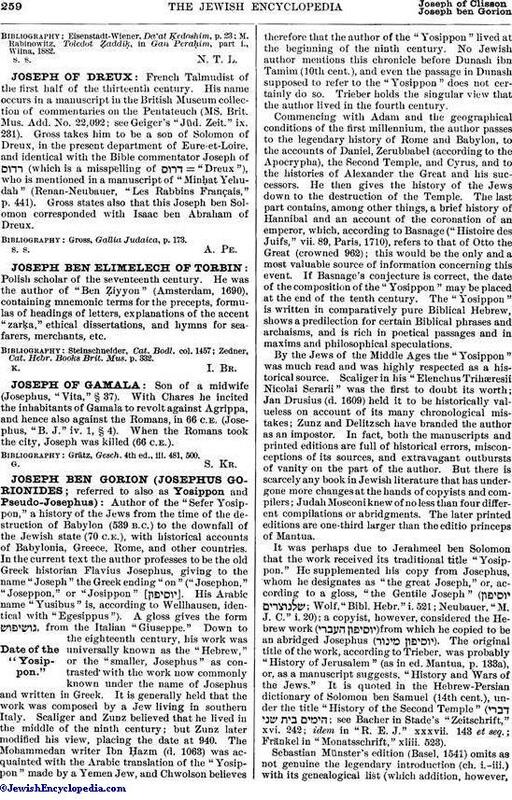 He supplemented his copy from Josephus, whom he designates as "the great Joseph," or, according to a gloss, "the Gentile Joseph" ( ; Wolf, "Bibl. Hebr." i. 521; Neubauer, "M. J. C." i. 20); a copyist, however, considered the Hebrew work ( ) from which he copied to be an abridged Josephus ( ). 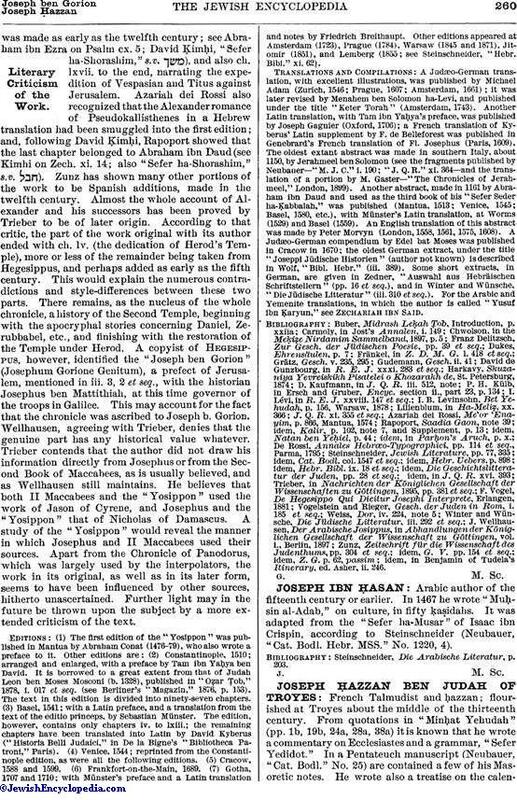 The original title of the work, according to Trieber, was probably "History of Jerusalem" (as in ed. Mantua, p. 133a), or, as a manuscript suggests, "History and Wars of the Jews." It is quoted in the Hebrew-Persian dictionary of Solomon ben Samuel (14th cent. ), under the title "History of the Second Temple" ( ; see Bacher in Stade's "Zeitschrift," xvi. 242; idem in "R. E. J." xxxvii. 143 et seq. ; Fränkel in "Monatsschrift," xliii. 523). Sebastian "Münster's edition (Basel, 1541) omits as not genuine the legendary introduction (ch. i.-iii.) with its genealogical list (which addition, however,was made as early as the twelfth century; see Abraham ibn Ezra on Psalm cx. 5; David Ḳimḥi, "Sefer ha-Shorashim," s.v. ), and also ch. lxvii. to the end, narrating the expedition of Vespasian and Titus against Jerusalem. Azariah dei Rossi also recognized that the Alexander romance of Pseudokallisthenes in a Hebrew translation had been smuggled into the first edition; and, following David Ḳimḥi, Rapoport showed that the last chapter belonged to Abraham ibn Daud (see Ḳimḥi on Zech. xi. 14; also "Sefer ha-Shorashim," s.v. ). Zunz has shown many other portions of the work to be Spanish additions, made in the twelfth century. Almost the whole account of Alexander and his successors has been proved by Trieber to be of later origin. According to that critic, the part of the work original with its author ended with ch. lv. (the dedication of Herod's Temple), more or less of the remainder being taken from Hegesippus, and perhaps added as early as the fifth century. This would explain the numerous contradictions and style-differences between these two parts. There remains, as the nucleus of the whole chronicle, a history of the Second Temple, beginning with the apocryphal stories concerning Daniel, Zerubbabel, etc., and finishing with the restoration of the Temple under Herod. A copyist of Hegesippus, however, identified the "Joseph ben Gorion" (Josephum Gorione Genitum), a prefect of Jerusalem, mentioned in iii. 3, 2 et seq., with the historian Josephus ben Mattithiah, at this time governor of the troops in Galilee. This may account for the fact that the chronicle was ascribed to Joseph b. Gorion. Wellhausen, agreeing with Trieber, denies that the genuine part has any historical value whatever. Trieber contends that the author did not draw his information directly from Josephus or from the Second Book of Maccabees, as is usually believed, and as Wellhausen still maintains. He believes that both II Maccabees and the "Yosippon" used the work of Jason of Cyrene, and Josephus and the "Yosippon" that of Nicholas of Damascus. A study of the "Yosippon" would reveal the manner in which Josephus and II Maccabees used their sources. Apart from the Chronicle of Panodorus, which was largely used by the interpolators, the work in its original, as well as in its later form, seems to have been influenced by other sources, hitherto unascertained. Further light may in the future be thrown upon the subject by a more extended criticism of the text.